"The Superior General of the Coalition 联军上将 (lián jūn shàng jiāng)"
If you thought Yu Ji 于吉 and Zuo Ci 左慈 were joke characters, wait till you hear the story of Pan Feng! Pan Feng was a fictional character wielding a poleaxe and was a general serving the weak warlord Han Fu 韩馥. In ROTK, Pan Feng was one many generals slayed by Hua Xiong 华雄, and he had a grand total of 2 lines of airtime in the entire story! So why did YOKA put such a non-consequential character in Kingdom Wars? Apparently, Pan Feng was repeatedly poked fun of by the online population and sarcastically given the title "The most powerful general in the Three Kingdoms Era". From this sprang forth numerous parody biographies that exaggerate his abilities to ridiculous extents. It seems that YOKA designed this character for his popularity within Chinese Internet users. Want to know more about Pan Feng's "larger than reality" parodies? Read on to find out! Character ability: "Insanity Axe 狂斧 (kuáng fǔ)"
Every instance after your ATTACK 杀 inflicts damage to your victim, you can select a card in the equipped item area of your victim and relocate it to your equipped item area, or discard it. The name of his ability relates to his weapon, but I cannot find any relevance to fictional or the fake biographies. Perhaps YOKA mixed up Pan Feng and Pan Zhang 潘璋, who captured Guan Yu 关羽 and took his crescent blade? By the way, this ability combines well with the ROCK CLEAVING AXE 贯石斧, the only axe weapon card in the game. One of the most famous parodies of Pan Feng was “The Great Biography of the Unparalleled Pan Feng 无双潘凤大传”, in which Pan Feng was a superior general of great strength and wisdom. He used a poleaxe of 180 catties (Guan Yu's only weighed 82 catties), and served Han Fu after seven visits by Han Fu himself (a parody of Zhuge Liang 诸葛亮 serving Liu Bei 刘备 after three personal visits by Liu Bei). He could beat up Yan Liang and Wen Chou 颜良文丑 easily. Fear of his presence, Yuan Shao conspired to kill him by giving him a sick horse as his mount so that he would be killed by Hua Xiong. 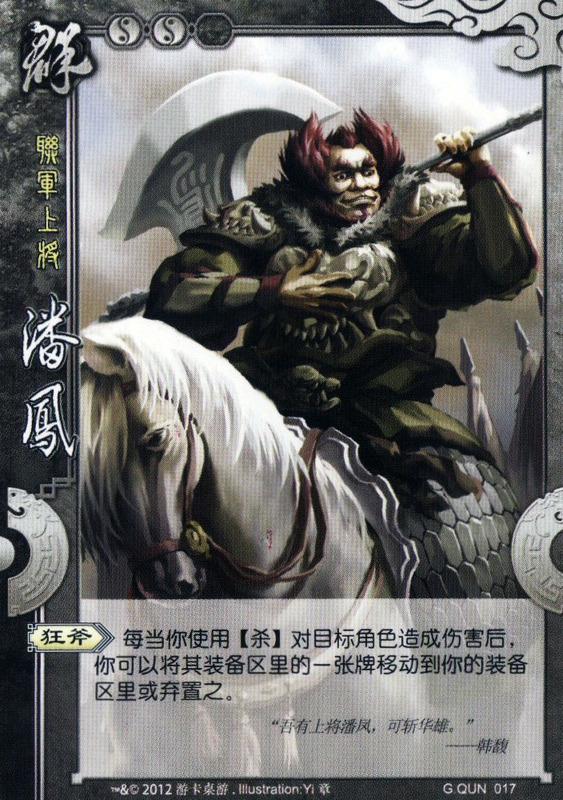 If you observe carefully, you would find that the horse of Pan Feng in the card illustration looks dreadly!